Kids love dinosaurs. Adults love dinosaurs. What's not to love? They're big, powerful and super cool. Air dry clay (available at arts and craft stores and some discount stores. Selection of sticks, leaves and rocks. Note: The damp cloth is for use if your clay becomes a bit dry. If it does, lay the cloth over it for thirty seconds or so. Also, if you need to leave your project at any time, cover the clay with the damp cloth otherwise it will begin to dry and set. 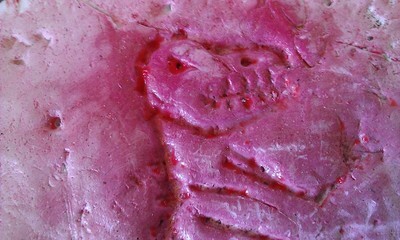 Cut off a piece of clay from your block, about 5 - 6cm wide. 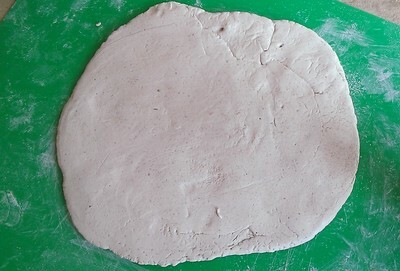 Shape the clay into a round shape. It doesn't have to be a perfect ball. Clay is quite firm so really pound it against the mat to shape it. Don't worry, it really does like a bit of tough love and you'll be amazed how relaxed you feel afterwards. Flatten your clay with the palms of your hands, pound it, stomp, push it...until it's about 1cm thick. Smooth the surface slightly with your damp cloth but don't completely erase all the lines and cracks, they add to the effect. 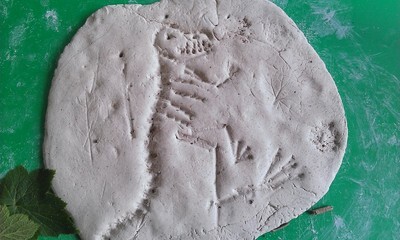 Use the point of your stick to draw a dinosaur skeleton on the clay. This is a guide so feel free to stray from the lines. Press the sticks and rocks into the guide you've made. Use your imagination. We used twigs for our T-Rex's arms and legs, a knobbly rock for the spine and a pointy wood chip to do the teeth. Don't forget the eye-socket and nasal cavity. 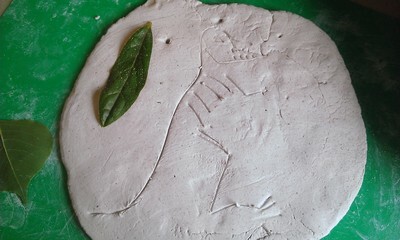 Make other imprints around the dinosaur using the leaves. Leave to dry. How long this takes will depend on your clay and ambient temperature so keep an eye on it and follow the directions given with your particular brand of clay. 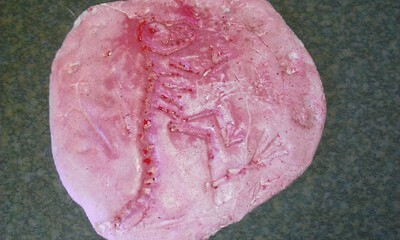 Once dry, paint your fossil in any colour you like. We went for pink but you could go for a more realistic sandy colour if your prefer.